This summer, we went on our first family camping trip. Sam and I have both done a fair amount of camping in the past, but had not set foot in a tent since we had children. In our heads, we had this idea of camping as the perfect solution to all our family travel dilemmas. It’s cheap, it’s do-able at the last minute so you can just pack the car up when the weather is looking fine – no advanced planning or booking needed unlike every single other holiday type. Plus all that fresh air and the great outdoors for the kids. 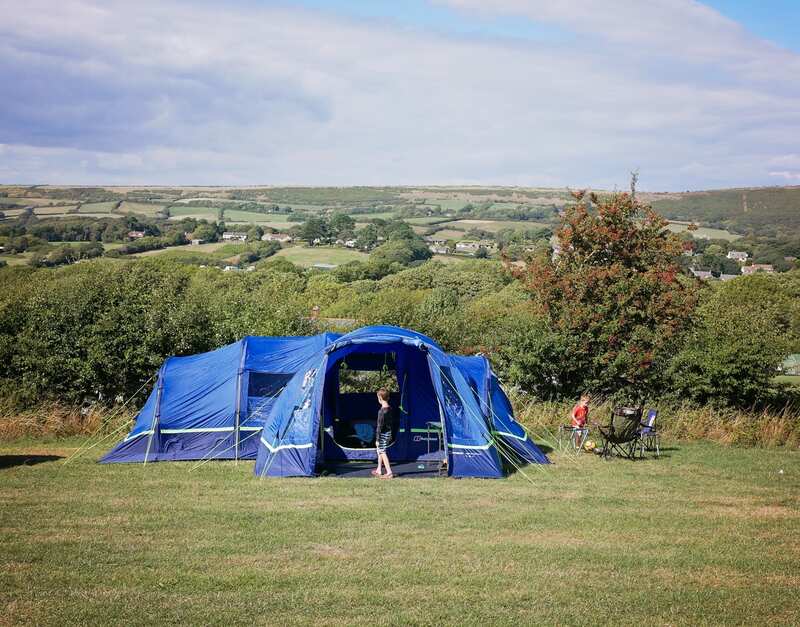 Camping felt like a great big adventure for our family, but were we romanticising it too much? What is it actually like to camp with young children? Would we discover that we are indeed the camping family type? Or would all that money spent on a tent and equipment end up being an expensive experiment? Allow twice as long as you think you need to set your tent up. The first time you set up a new tent always takes longer as you try and work out where everything is. Don’t venture too far away for your first camping trip. Due to the added time it will take to set up and take down your camping setup for the first time, we found it removed an element of stress to not have a huge drive at the end of it all. If you are a family of four, get a six person tent. For a family of five or six, get an eight person tent. The extra space is extremely handy and it means you aren’t all sleeping on top of each other – you have the option to spread out. It also means you have space to invite friends on camping trips with you. Take long sleeves and warm layers, even in summer. It gets cold at night and early in the morning. Take more than one pair per person so you always have backup warm clothes. Make sure you have enough space in your car. Tents, cool boxes, food, bedding, etc – all takes up a lot of room! If you can spare the space, bring two tables – one for preparing food and cooking, another one for eating. Don’t splash out on all the top end kit for your first trip. It’s hard to know whether camping is for your family until you’ve tried it out. But what if you’ve spent a lot of money on camping gear only to realise camping is not your thing? For our first family camping trip, we went budget on air beds and our cooking setup. I know we’ll feel a lot more comfortable investing in better quality equipment once we’ve got a few more camping trips under our belt and are confident that more expensive kit will be put to good use. By that point, we’ll also be in a better position to know which bits of kit are worth investing more in and which parts of our existing kit are fine as they are. Air tents don’t save you as much time as I assumed they would. You save the time it takes to connect tent poles together and feed them through, but that’s it. Everything else takes just as long, the packing away of the tent perhaps takes even more time due to flattening everything down / removing the air from the tent. I do think, though, that once we are better practised at putting up and taking down our tent, this whole process will get a lot quicker. You do need stamina. Cold nights, long walks to toilet blocks, no sofas to rest your back and snuggle in to, the physical aspect of putting up tents, airbeds, etc. It’s not the type of holiday that will make you feel well rested. Don’t just consider camping because it’s cheap – You have to actually LIKE the idea of camping to enjoy it. If camping sounds like your idea of a nightmare trip, it probably is. So… are we a camping family? Our first family camping trip actually ended in a bit of a disaster. We lasted one night before one of our children came down with a tummy bug – meaning we cut our trip short and ended up packing down in high winds and rain and a lot of bickering between Sam and myself. Fun. But for one day, it was brilliant. The kids LOVED the adventure of sleeping in a tent and cooking our food on a little gas stove. I loved watching them run around and ‘be at one with nature’. Our campsite (Downshay Farm) had an amazing view over the hills of Dorset and Corfe Castle. Being outside when the sun sets was a treat for me – I got some lovely footage and shots of the children in golden light, which rarely happens in any other situation, as we are always rushing home for bedtime. We brought all our own food with us, so the total cost of camping was just petrol money and the cost of the camping pitch. Making it the most affordable trip we’ve ever taken (minus the initial cost of the camping kit). The affordability of camping really has opened up the whole of the UK for us. There are always so many things around the country on my summer bucket list that previously would have involved a hotel stay, but now we have our tent, we can do all these things at a much lower cost. Disclosure: We purchased our tent and all our camping gear ourselves. This is not a brand partnership.